If you’ve planned a wedding, you know what it takes. Guests lists, linen choices, the juggling of families and friends, invitations, attire, and a plethora of other decisions about details big and small. Managing it all without turning into a raging bridezilla (or groomzilla in the name of gender equality) requires finesse and more than a little patience. It’s a wonderfully exciting time, but it’s also exhausting. So could you imagine adding a cooking challenge to your engagement? 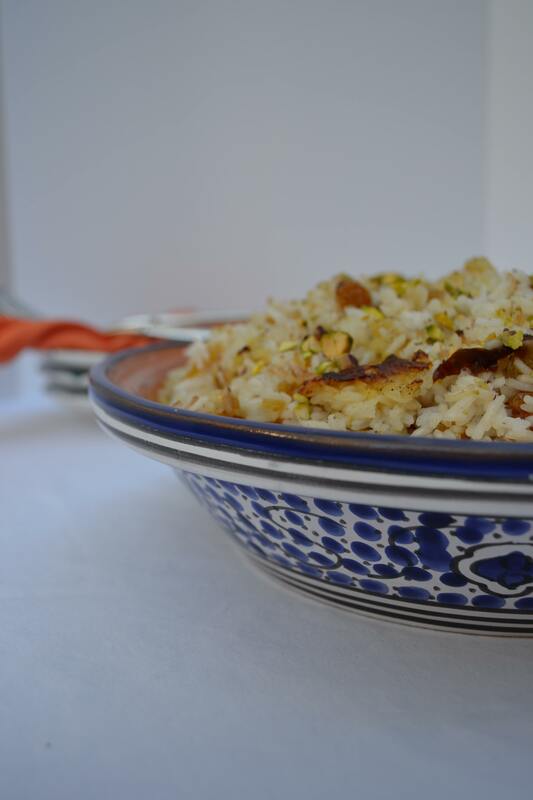 This recipe for jeweled rice is a traditional part of a Persian wedding banquet. 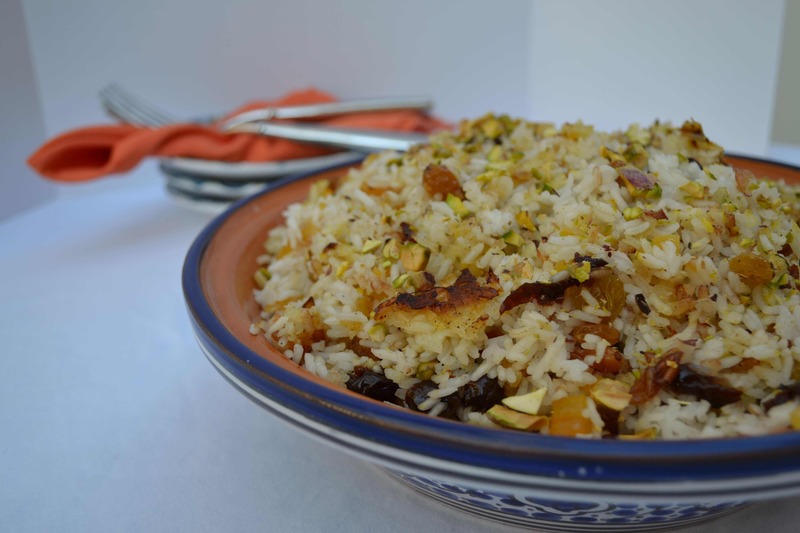 The rice, studded with dried fruits and sprinkled with pistachios, is said to bring good luck to the newly married couple. I’ve also read that a bride’s cooking prowess is judged by her ability to execute this dish. Parboiled before being tossed with dried fruits, the rice is then scooped atop sautéed onions in spiced butter. You don’t add water to the pot and during cooking, the rice at the bottom crisps up to form a crunchy layer known as tah-dig while the rest of the rice steams until tender. Heat control is key here and it’s a bit of a tricky balance for the cook. I, for one, know that I wouldn’t have wanted to add it to my pre-wedding festivities although I would have delighted to have this sultry dish on my buffet table. This time of year, I like to pull out Persian Jeweled Rice to add splash to my holiday table. It’s hard to change tradition and if you are like me, you have your favorite Thanksgiving dishes that you want to be the same year after year. Yet as a cook, you might also desire to get out of your routine and do a little something different. Enter this recipe. While folks may delight in your sweet potato casserole or your homemade apple pie, I would guess that the rice on your table does not gather guests round. Why not change that? This spectacular dish requires a bit more prep than traditional rice, but it’s well worth your effort. Don’t feel compelled to follow the recipe directly. 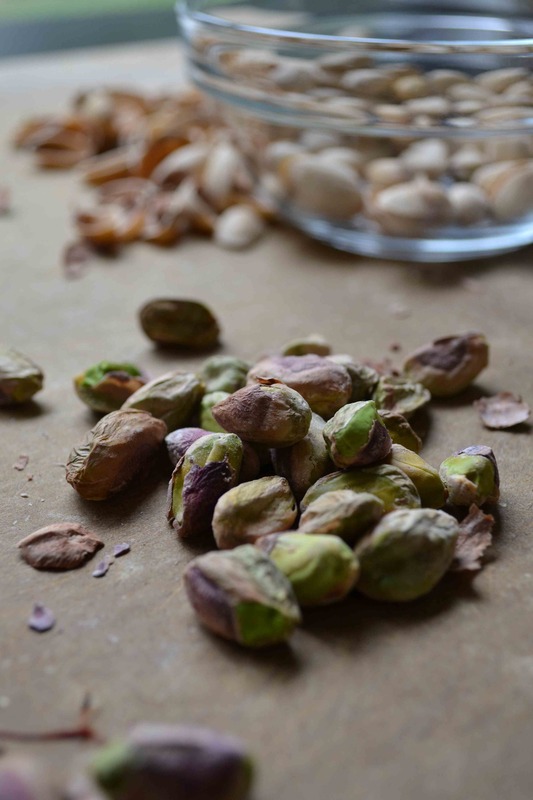 Use whatever dried fruits you have on hand and toasted sliced almonds would make a worthy substitute for the pistachios. Do rinse your rice repeatedly before parboiling. This step rinses off the starch and ensures that your finished product is light and fluffy. Happy cooking! In a large (5-quart) pot, bring the water and salt to a boil. Wash the rice under running water several times. 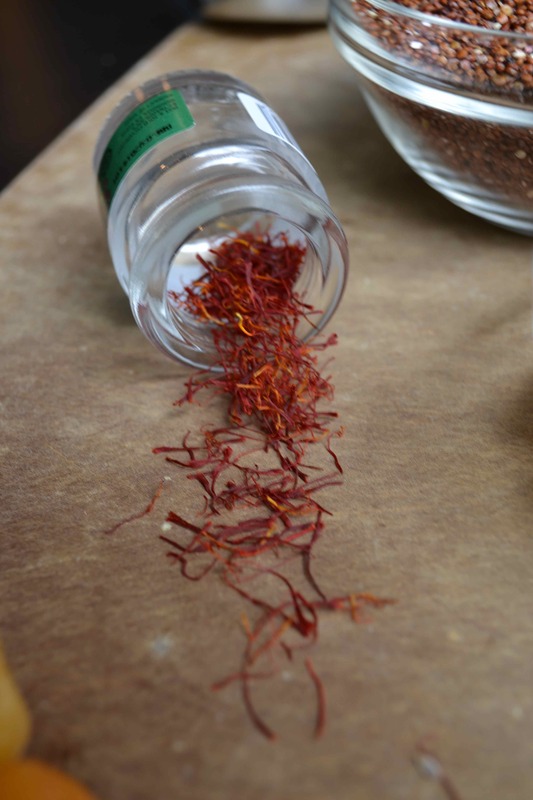 Make a bouquet garni using cheesecloth and twine, containing the cinnamon stick, whole cloves, and black peppercorns. Once the water is boiling, add the rice and the bouquet garni to the pot. When the water returns to a boil, cook for 5 minutes then drain the rice and let it sit in a sieve. Do not discard the bouquet garni. Toss the fruit together in a large bowl. In a large Dutch oven, melt the butter over medium heat and stir in the ground cardamom. Remove three tablespoons of the butter and set aside. Add the saffron threads and the yellow onion to the pot and sauté until the onion is soft. Spread the sautéed onions evenly over the bottom of the pot. 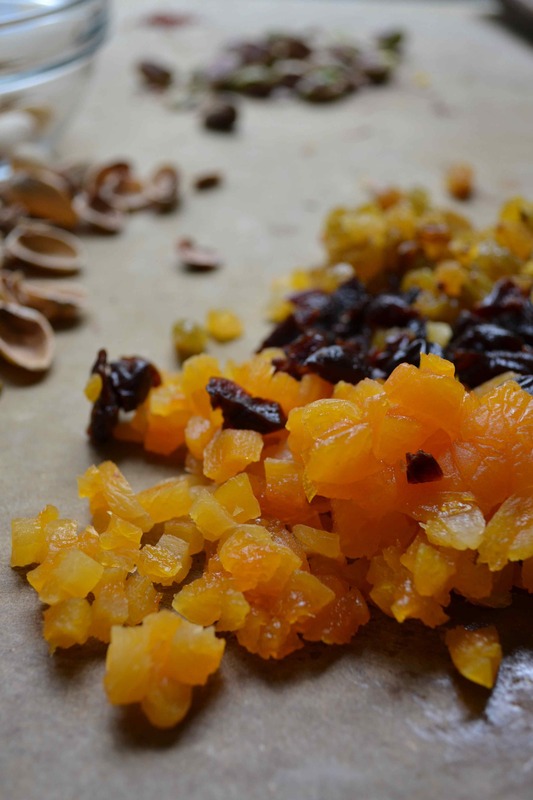 Add the rice to the dried fruit and toss to combine. Pour the rice, dried fruit and the bouquet garni over the sautéed onions and butter. Make holes in the rice to the bottom of the pot with the handle of a wooden spoon. Drizzle the remaining 3 tablespoons of butter over the rice. Cover the pot with a tea cloth and a heavy lid (be careful that the tea cloth is not close to the flame). Cook over medium-low heat for 30 to 35 minutes. Let the rice sit, off heat, for at least 15 minutes. Scoop the rice out of the pot and into a bowl. If needed, dip the bottom of the pot into a bowl of cold water to loosen the crunchy rice (tah-dig) that is covering the bottom of the pot. Scoop the crunchy rice out of the pot and sprinkle it over the rice. 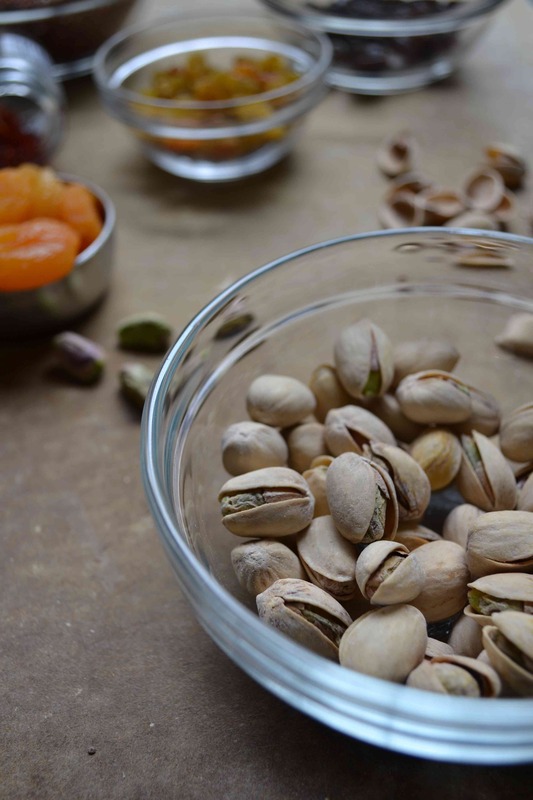 Sprinkle the final dish with the chopped pistachios and serve. Thanks! If you try it, let me know what you think. It’s definitely not your normal rice. Thanks for reading. Lots of interesting flavours going on here! Sounds delish.